Whether you’re interested in whitewater rafting, mining for gold, exploring hidden caves, searching for Bigfoot or sleeping within earshot of Arctic wolves, GoCampingAmerica.com can help you find independent campgrounds that nurture your family’s sense of adventure and wonder in the Great Outdoors. “Most people are familiar with our state and national parks. But America’s privately owned campgrounds also offer unique travel experiences that are particularly appealing to families,” said Paul Bambei, president and CEO of the National Association of RV Parks and Campground, which hosts the GoCampingAmerica website. Cascade Caverns Campground in Boerne, Texas, is one of 3,300 campground in the searchable database. It offers families a chance to explore its namesake cave, where scientists have recovered bones from mastodons and saber-toothed tigers. The cave is currently inhabited by several unusual insects and animals, including Cliff and Leopard Frogs, Eastern Pipistrelle Bats, Cave Ground Beetles, Cave Crickets and Cascade Caverns Salamanders. Some campgrounds even have wild animals on display. Camp Taylor Campground in Columbia, N.J. has a wolf preserve on site with 25 arctic and gray wolves, so you can literally hear them howl at night. Deer and bear sightings are also common at the campground, which is located about an hour’s drive from New York City. Indeed, the campground was built on the site of a gold mining camp that was established in the 1930s by the Fairbanks Exploration Company. Now a National Historic Site, visitors to the Chicken Gold Camp can learn about the history of mining and even try their hand at panning for gold or mining on the park’s gold claims. 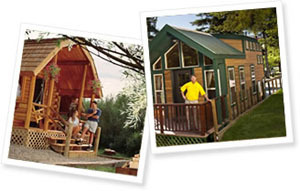 For more information on campgrounds, RV parks and resorts that offer unique activities and adventures, visit www.GoCampingAmerica.com .